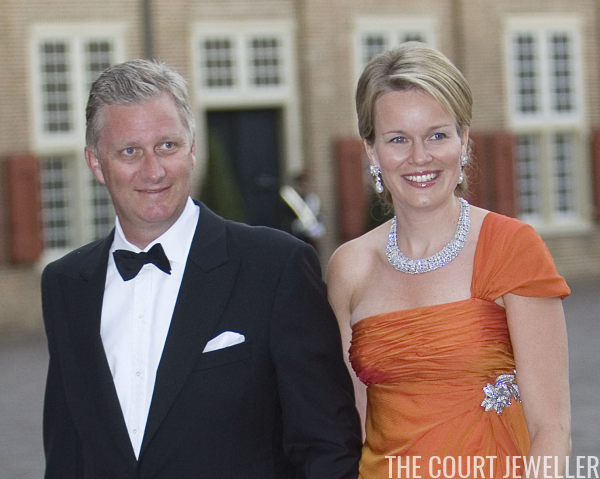 Queen Mathilde of the Belgians (then the Duchess of Brabant) wore glittering diamonds with an appropriately orange gown for the evening. Her accessories included diamond and pearl earrings and a diamond necklace. I believe the sparkling embellishment on her gown is a part of the dress, not a separate brooch. 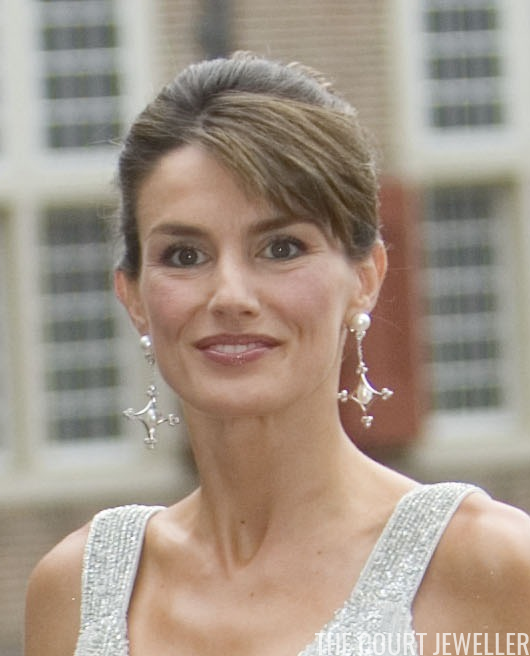 Queen Letizia of Spain (then the Princess of Asturias) wore silver and white, accessorizing with diamonds and pearls. She wore one of the biggest pairs of statement earrings we've ever seen her in: silver earrings with a cross motif, set with pearls. 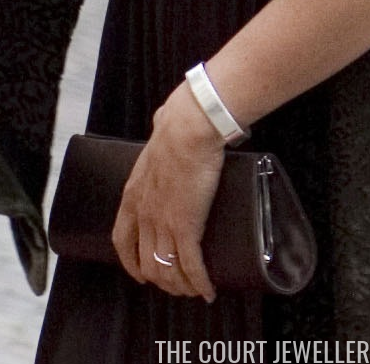 On her left arm, she wore her diamond cuff bracelet from Cartier. In a rather unusual touch for Letizia, she also wore delicate golden bracelets on her right wrist. 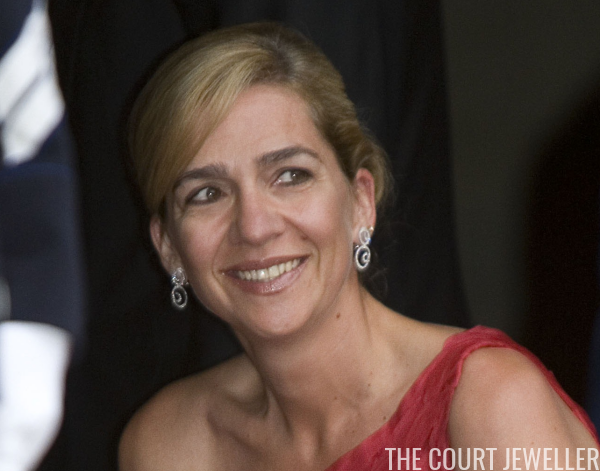 Letizia's sister-in-law, Infanta Cristina of Spain, chose whimsical earrings for the party. 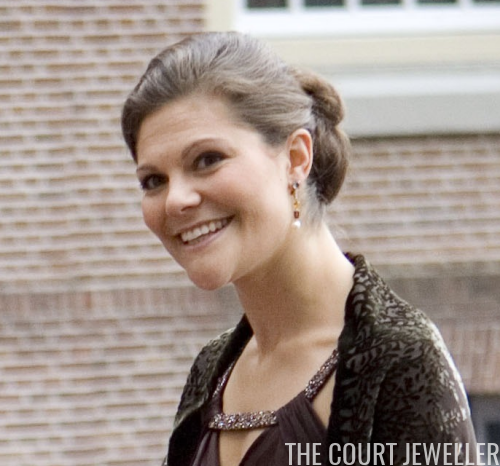 Here's a better look at the earrings, which look like diamond curliques. 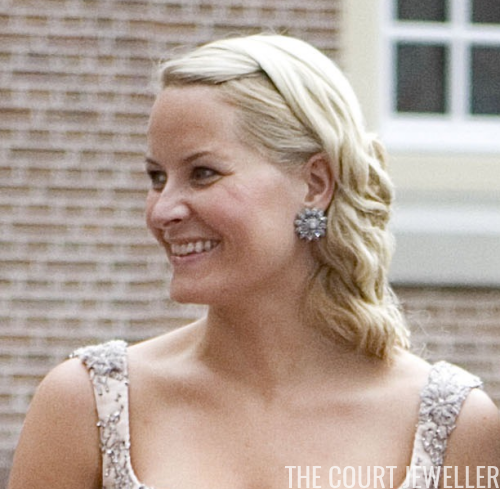 Crown Princess Mette-Marit of Norway wore neutral colors, as usual. But she shook things up a bit with an over-sized pair of stud earrings with a floral motif. 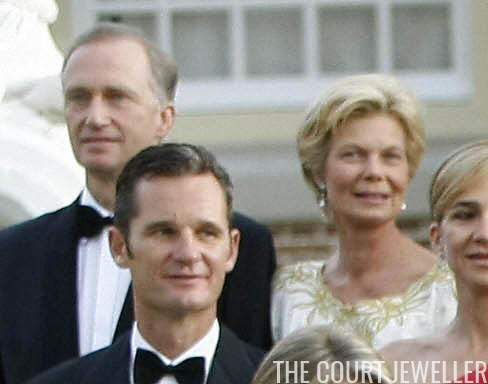 Haakon and Mette-Marit were accompanied by Crown Princess Victoria of Sweden, who chose minimal jewels for the occasion. ...and a silver bracelet on her left wrist. She also wore rings on both hands. 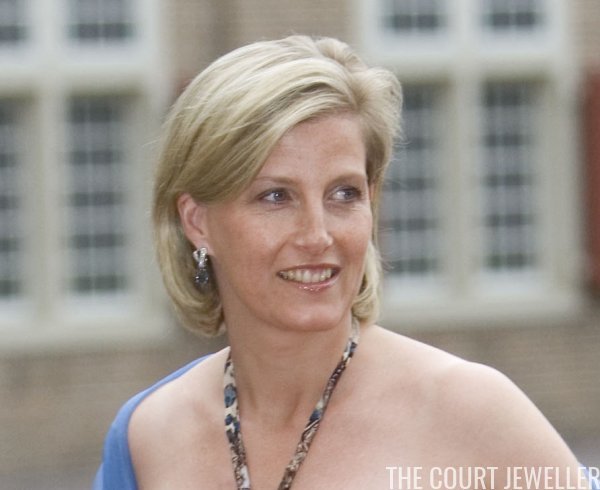 Princess Sarvath of Jordan wore one of her gorgeous saris for the party. She finished her outfit with coordinating golden jewelry with pink gemstones. Prince Hassan and Princess Sarvath's daughter, Princess Badiya, also attended the party. She was accompanied by her husband, Khaled Edward Blair. She wore a lovely suite of diamond jewels, including a necklace, bracelet, and earrings, for the event. The Earl and Countess of Wessex, who have become close to many of the European royals, attended the party. She was expected their second child, Viscount Severn. Sophie chose her modern diamond and blue topaz earrings for the event. Miriam kept her jewels simple, wearing only a cocktail ring on her right hand. Princess Rosario, pictured here with her husband, Prince Kyril, wore no jewelry, but that's not a surprise -- she almost never wears significant accessories. We also got glimpses of a few more royal guests in the group photograph. 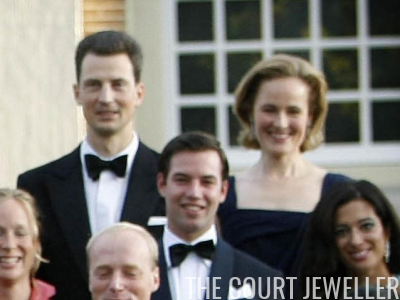 We can just see a pair of earrings on Marie Astrid of Austria, who is a sister of the Grand Duke of Luxembourg. She's standing beside her husband, Archduke Carl Christian. Which jewels from this party were your favorites?